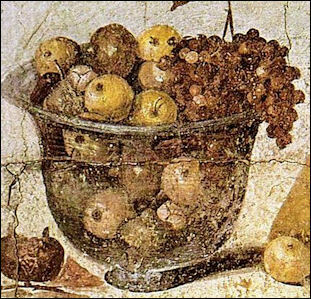 of wine and fruit from PompeiiRome was praised by Virgil in 29 B.C. for its grain, wine, olives and "prosperous herds." Food was never a problem in Rome. The land around the city was productive and as the empire expanded it was fed by fertile land in Tunis and Algeria. Among other things Romans ate doves, chickens, figs, dates, olives, grapes, white almonds, truffles and fois gras and cooked fowl in clay pots. There were no tomatoes, potatoes, spaghetti, risotto, or corn. Romans often turned up their noses at the food from outside Rome. On the food in Greece a character in a satire commented: “They give weeds to their guests, as though they were cattle. And they flavor their weeds with other weeds." Major crops included grapes, olives, peaches, cherries, plums and walnuts.Romans grafted apple trees and spread apple cultivation throughout their empire. The main pieces of farm machinery were olive oil presses. Rabbits are believed to have been domesticated using wild rabbits from Iberia in the Roman Era. 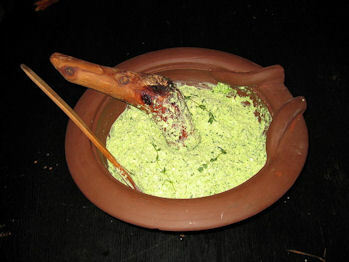 Romans liked putrid fish sauces and ate sweet-and-sour, spicy and curry-like dishes. Appetizers included salted fish, pigs’ feet, hard boiled eggs, and stuffed artichokes. The Romans regarded honey as a medicine and drank coriander mixed with honey as a remedy for childbirth fever. The Romans also ate insects. Pliny wrote they were particularly fond of grubs called cossus, which he said could be made into “the most delicate dishes." They didn't eat horse meat. Among the desserts consumed by Romans were fruit and custard in honey-sweetened goodies. 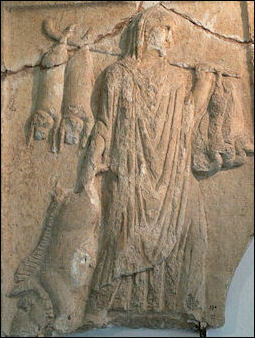 Chilled fruit juices, milk and honey were enjoyed in the time of Alexander the Great (4th century B.C.). Nero (1st century A.D.) ate desserts made from snow brought in from the mountains. The earliest known cookies were made in Rome in the third century B.C. They were unleavened, bland, hard wafers. The words “cookie” and “biscuit” are derived from the Latin word bis coctum, which means "twice baked." Roman cookies were often dipped in wine to soften them up. 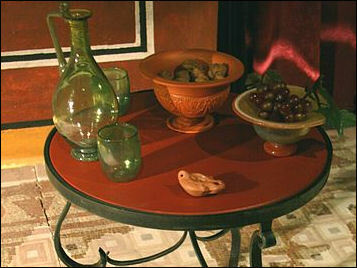 Romans hosted elaborate dinner parties with hosts trying to top one another with the most elaborate dishes. They ate ostrich brains, peacocks, dolphin meatballs, herons, goat feet, peacock brains, boiled parrot, flamingo tongues and orioles. They liked watching birds fly out of featured dishes and ate an electric fish because “it was fascinating." Sometimes a calf was cooked up with a pig inside it and inside the pig were a lamb, a chicken, a rabbit and a mouse. The Roman Emperor Elagabalus once ordered 600 ostriches killed so his cooks could make him ostrich-brain pies. The Roman elite indulged themselves with unusual foods such as nightingale tongues, parrot heads, camel heels and elephant trunks. One of the greatest delicacies was foie gras made by force feeding geese with figs to enlarge their livers. The Roman are sometimes credited with inventing foie gras, but the Greeks also ate it. The massive feasts and exotic delicacies for which Rome is famed were enjoyed only by the upper classes. Most of the remaining populations ate a diet consisting primarily of course grains like wheat and millet. Despite living near the seas, lower-class Romans appear to have eaten very little fish or seafood and suffered from a variety of diet-related health problems such as anemia and poor dental hygiene. City dwellers appear to have eaten better than people in rural areas and the further from Rome one lived the worse their diet was. “The “anthropometric” approach pursued by Nikola Koepke of Oxford University, which combines biology and archaeology, suggests longer bone length is indicative of improved diet. Koepke’s study, presented at the Economic History Society’s 2010 annual conference, also challenges assumptions about the effect of the industrial revolution. Urbanisation did not improve wellbeing, she argues, at least as measured by height. Text Sources: Internet Ancient History Sourcebook: Rome sourcebooks.fordham.edu ; Internet Ancient History Sourcebook: Late Antiquity sourcebooks.fordham.edu ; Forum Romanum forumromanum.org ; “Outlines of Roman History” by William C. Morey, Ph.D., D.C.L. New York, American Book Company (1901), forumromanum.org \~\; “The Private Life of the Romans” by Harold Whetstone Johnston, Revised by Mary Johnston, Scott, Foresman and Company (1903, 1932) forumromanum.org |+|; BBC Ancient Rome bbc.co.uk/history/ ; Perseus Project - Tufts University; perseus.tufts.edu ; MIT, Online Library of Liberty, oll.libertyfund.org ; Gutenberg.org gutenberg.org Metropolitan Museum of Art, National Geographic, Smithsonian magazine, New York Times, Washington Post, Los Angeles Times, Live Science, Discover magazine, Times of London, Natural History magazine, Archaeology magazine, The New Yorker, Encyclopædia Britannica, "The Discoverers" [∞] and "The Creators" [μ]" by Daniel Boorstin. "Greek and Roman Life" by Ian Jenkins from the British Museum.Time, Newsweek, Wikipedia, Reuters, Associated Press, The Guardian, AFP, Lonely Planet Guides, World Religions edited by Geoffrey Parrinder (Facts on File Publications, New York); History of Warfare by John Keegan (Vintage Books); History of Art by H.W. Janson Prentice Hall, Englewood Cliffs, N.J.), Compton’s Encyclopedia and various books and other publications.